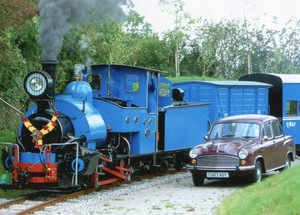 London: The world’s oldest surviving Darjeeling Hill Railway locomotive is back on track, thanks to Adrian Shooter, and is running on his lawns inside his mansion in London. Smitten by the magic of a ride on the DHR (now an Unesco world heritage property) a decade and a half before, Shooter who retired three years before as chairman of Chiltern Railways bought off the world’s oldest surviving DHR locomotive – model number 778 built in 1889 by Sharp Stewart and Company, Manchester to restore it into perfect condition and run it in his personal garden. The Indian government had sold off the locomotive to Hesston Steam Museum in 1960, not realizing what it’s worth would be 50 years later, after being declared a world heritage by Unesco. Most interestingly, Shooter has also bought an Ambassador car that runs by the train when it chugs through his garden to give it a real feel of Darjeeling. Shooter shipped the loco in a container from US to the steam rail workshop in Tyseley, Birmingham where he restored it into perfect running condition. The laid tracks over 1.5 km is in the form of a loop just like in Darjeeling. He has also built a station that looks exactly like the original Sukna station in Darjeeling besides laying a pathway that criss crosses over the rail tracks, exactly the way it is in Darjeeling. Shooter said “I bought the locomotive from the museum in Indiana, USA, in 2002. It had been bought by a private individual, Mr Donnelley in 1960. He died in 1975 and it passed to the museum after that. He was the boss and major shareholder in R R Donnelley Co which is a very large printer and publisher in Chicago”. He added “I have several volunteers who come and help me operate the loco and we give rides to invited guests. We usually have 100-150 and do this 3 or 4 times a year. The loco is fully functional and is in excellent condition. Last winter it had a 10 year overhaul when, by law,the boiler has to be taken off the chassis, carefully examined and repaired as necessary”. “The loco still has the original 1889 boiler and is, by at least 50 years, the oldest loco boiler in use in the UK. There are a couple of older ones in India. The reason that it has lasted so long is that it is made of wrought iron which is much more corrosion resistant than steel. It was obviously very well looked after during its 70 years of use in India”. Shooter who will be in Delhi in February because he has been invited by Mark Tully to speak at the Indian Steam Conference added “The Darjeeling Railway is very special because it climbs so high (over 7000 feet) through fantastic countryside with wonderful people (The Gorkas). Many British people had ancestors who lived, worked or visited Darjeeling. I still regularly come across people who went to school in Kurseong or Darjeeling. The engines, themselves, are of a very sound design that have shown themselves to be more than capable on a very steep and curvaceous railway”. Shooter said he has no plans to return the loco to India. “It runs in my garden which is about 600 yards long”. Britons will get a chance to get a ride on the train as it makes a special appearance at the high North Pennines on 26 – 28 September. South Tynedale Railway at Alston is hosting Shooter’s train – Locomotive No 19 for an Indian-themed weekend of food, music and films. People will be able to ride the train, dress like a local from Darjeeling and enjoy sumptuous eastern Himalayan cuisine. Built in 1889, Locomotive No19 was withdrawn from the Darjeeling-Himalayan Railway service in 1960 and, privately purchased, made its way to Indiana and then, in 2003, across the Atlantic to be restored by Tyseley Locomotive Works, Birmingham, for Shooter. At the same time, two replica DHR carriages were constructed at the Boston Lodge Works of the Ffestiniog Railway. These and the loco are based at Adrian Shooters private garden railway. India presently has 14 original DHR locomotives in working condition and 10 others on display at museums. Shooter’s train is the oldest of all DHR trains. Presently, only 5 DHR locomotives are in private hands, four of which are in Assam. The 778 is the only model outside Indian shore. Indian railway expert Rajesh Agrawal said “In the 1960s, India was disposing off a large number of locomotives as we had more than we required. One such model was the 778. Nobody knew then that the DHR would become such a prized object. Also people thought the 778 was not in working condition as it was 71 years old. A locomotive generally retires at 45 years”.